This year marked the 21st year that I’ve been visiting London’s annual Ace Cafe Reunion. 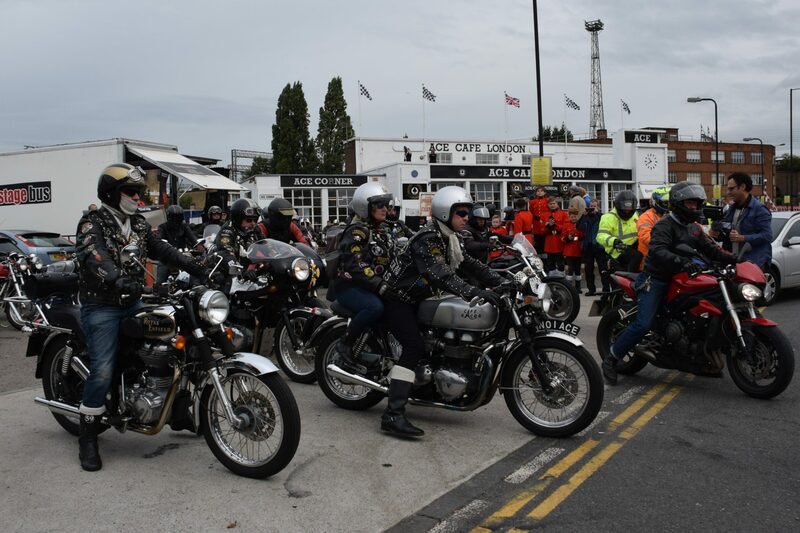 The fabled transport cafe, built in 1938, was the home of a tire depot when the first reunion was held in 1994 and after re-opening in 2001, the crowds that gather for the ride from North London down to the beach at Brighton have grown year by year. There’s a lot of ton-up history to take in during a weekend here and it’s ceaselessly amazing to see the dedication to speed and style on display. Unlike too many Stateside custom bike gatherings, the ACR is all about riding and if you’ve ever pushed your one-off machine into an indoor hall for display, you’d be gobsmacked to see how many old school Rockers brave the elements and wheel out their cherished cafe racers for this unique event. After catching up with old chums on Friday and Saturday – where a cafe racer show was held that appears in an upcoming issue- the big even is the 85-mile burn-up down to the Brighton seafront. Back in ’97, there was maybe 5,000 enthusiasts in attendance. Today, crowd estimates have reached over 30,000 with all sorts of two-wheeled art on display from ancient Vincents and BSAs to modern streetfighters and plenty of classic street racers. It’s well worth the airfare to see for yourself- or check out a full pictorial in Cafe Racer magazine’s October/November issue.